he lived the lifestyle of a normal cat, and his name was Fred. Fritz started walking on his hind legs, wearing clothing and being called "Fritz" in "Robin Hood" (1960). But neither story "appeared", in the usual sense of the word, until 1987, when Fantagraphics Books published its first volume of The Complete Crumb Comics. The stories were originally part of a series of "two-man comics" Robert Crumb did with his brother Charles, for their own amusement, when both were in their teens. It wasn't until years later that Fritz turned up in an actual publication. That's when "R. Crumb" (as Crumb usually signs his work) started appearing in Harvey Kurtzman's Help! magazine (which also published Gilbert Shelton's first Wonder Warthog story). Fritz, who had been honed and shaped by years of comics stories done mainly for Crumb's personal expression, was the subject of the first two-pager Crumb sold to that outlet, which appeared in the 22nd issue (January, 1965). Over the next few years, Crumb's cartoons were published in venues ranging from American Greetings Corporation to Cavalier magazine. His 1960s characters included Eggs Ackley, Roberta the Office Girl, Mr. Natural, Schuman the Human, and many others, but Fritz is the one he kept coming back to. When "underground" comix started appearing, in the late '60s, Crumb began his rise to fame, and Fritz rose with him. In 1969, Ballantine Books brought out a tabloid-size collection of Fritz the Cat stories. In the early 1970s, Ralph Bakshi, a cartoon director who had gotten his start at Terrytoons working on Mighty Mouse and Sidney the Elephant, chose Fritz to kick off his career as an independent producer, and secured rights to use the character in the world's first X-rated animated feature. Crumb and Bakshi differed over creative matters, and what rights had been granted. Bakshi prevailed, and the feature was released in 1972. It was only a modest commercial success, however. When the sequel, The Nine Lives of Fritz the Cat, was released in 1975, neither Bakshi nor Crumb was involved. That ended Fritz's career in animation. Crumb responded by giving his character a decisive death scene, in one last comix story. 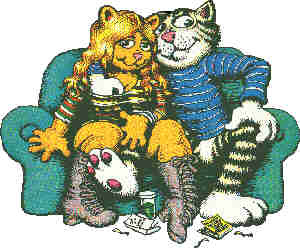 Crumb went on to become one of America's most highly regarded (tho controversial) cartoonists, but never did another story about Fritz the Cat. Text ©2000-05 Donald D. Markstein. Art © Robert Crumb.